Womens are fashionista they want to have every trending clothes in their closet. The reason why women need to have a leather jacket is that it never goes out of fashion plus its appealing, beautiful designs gives them an attractive and confident look. What are the best colors in Womens leather jackets? Black and brown leather jacket for womens are trending but you can also choose burgundy and beige colors. Are slim fit jackets best for women? How much a real brown leather jacket women would cost? 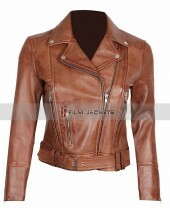 Depending upon the quality, a real brown women leather jacket will cost you around 120$ - 250$. How long does a real leather jacket last? Good real leather jackets for women can last up to 15-20 years. Which color jacket will match with my blue jeans? The black leather jacket women fit with every suit, especially with blue jeans too. How do you dry a genuine womens leather jacket? The simplest way to dry or remove the smell from the womens leather motorcycle jacket, just hang it for 1-2 days in the open air. How can you tell real leather from fake? Faux leather doesn’t contain pores on its surface while real leather contains the pores. Simple water absorption test distinguishes between real and fake. Are womens leather jackets waterproof? Leather jackets are naturally water resistant but not waterproof, however, you can make it by applying waterproof-spray or wax. Can you wear black women leather jacket in the rain? You can wear leather jackets for women in light rain because they are water resistant and durable. Is women leather jackets washable? Our black leather jacket women collection made from high-quality leather they don’t need frequent washing, use a damp cloth to clean it. Which lining is used inside the womens leather jacket? There are many types of inner lining used such as rayon, silk, printed fabric, viscose, fleece, and shearling. Mostly viscose is used in normal jackets because it is skin friendly.